Beyoncé goes full feminist at the VMAs. 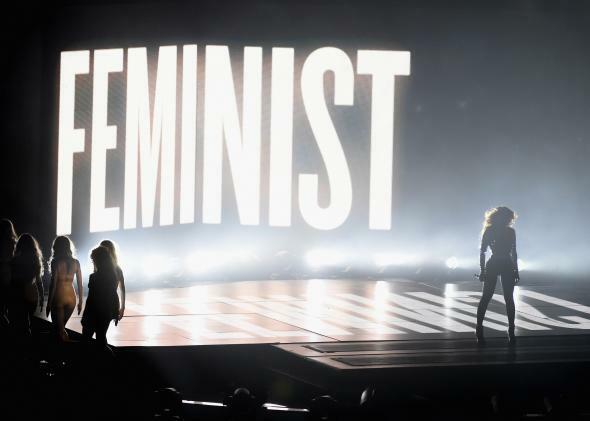 Rush Limbaugh’s claim that feminism exists “to allow ugly women access to society” is going to be a harder sell now that Beyoncé stood in the dark in front of the glowing “Feminist” sign at Sunday night’s MTV Video Music Awards. It’s no surprise that Beyoncé identifies as a feminist: She featured a speech on feminism by Chimamanda Ngozi Adichie on her song “Flawless” and wrote a piece for the Shriver Report titled “Gender Equality Is a Myth!” But the VMAs statement was next level—an unusually mainstream flaunting of feminist pride in our image-driven culture. And man did it feel good. Claiming that feminists are man-hating, haggard, bitter, unlovable women has been the primary strategy of anti-feminists since the era of the suffragists. In a male-dominated media, it’s been incredibly effective, for nearly two centuries now, at scaring people—particularly women—away from calling themselves feminists. Even in the 21st century, only a fifth of Americans identify with the term feminist, even while they sign off on the belief that women should be equal to men. Which is why Beyoncé’s statement—a political statement, really—is so meaningful. Having her husband and daughter up onstage was a nice touch, too. Having dismantled the idea that feminists are just ugly wannabes during her performance, she might as well clean house by smashing the notion that feminists hate men or are somehow not maternal. … the over-the-top End of Men vibe makes the “Anaconda” video feel like a fitting coda for the summer of 2014, which at times felt like a hyper-feminized corrective to a 2013 dominated by the breezily cologne-drenched perspective of Robin Thicke, TI and Pharrell’s “Blurred Lines,” and a spring ruled by Chris Brown, Lil Wayne, and Tyga’s annoyingly ubiquitous “Loyal.” The biggest hits and most-discussed viral surprises of this summer were girl-on-girl collaborations — Iggy Azalea and Charli XCX’s “Fancy”; Jessie J, Ariana Grande, and Nicki Minaj’s “Bang Bang”; Beyoncé and Nicki’s “Flawless” remix; and Ariana and Iggy’s “Problem,” on which Big Sean’s voice is reduced to a superfluous whisper. Who knows if female empowerment will still be in fashion next year. Still, it’s incredibly heartening to see female entertainers use their platform to dispel long-standing myths about feminism. Even Taylor Swift is getting in on the action, telling the Guardian that while she used to fall for the myth that feminism “was that you hate men,” she now understands “it’s not about that at all” and instead about pushing for a society where “women and men will have equal rights and equal opportunities.” Swift thinks that “a lot of girls have had a feminist awakening because they understand what the word means.” Anyone still figuring it out got a pretty good education from Beyoncé last night.